I am so in love with this Hero Arts stencil. And was so excited to use it with distress stains for this Rainbow challenge. I knew I wouldn’t get a perfect impression, and looked forward to embracing that imperfection. That’s a hard thing for me to do, ahem. 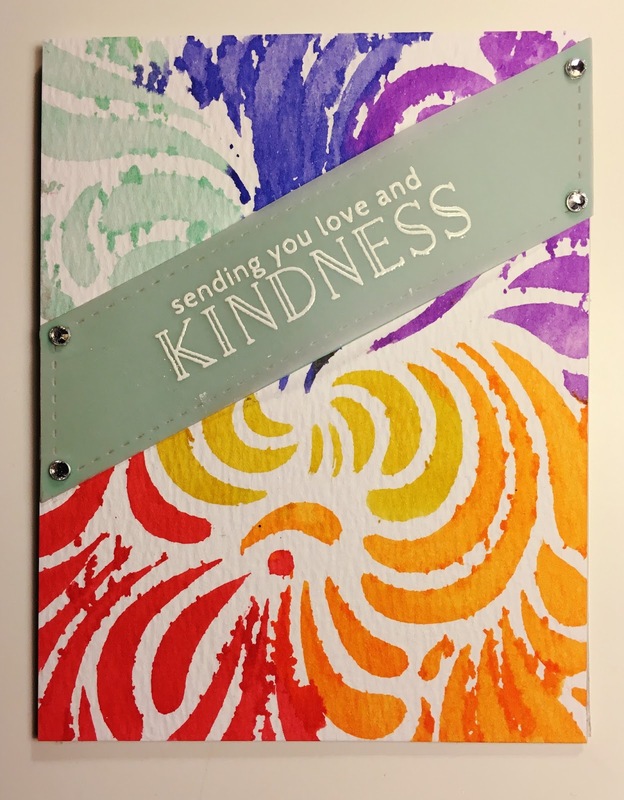 Super simple to make, just placed the stencil over the watercolor paper, pounced the distress stains over it in a rainbow order, then adhered that to a card base. Stamped the sentiment on some vellum, and used a die from Lil Inkers to cut that out, and also to cut the same shape from pool paper so that you could see the sentiment on the vellum. I’m happy with this card, but now that I stare at it in a picture, I think I’ll make it again, and use a black strip for the sentiment. Make sure to play along with our challenge this month, we’ve got a prize from Avery Elle up for grabs! The colors are excellent, great card. never thought to rainbow a stencil–lovely!